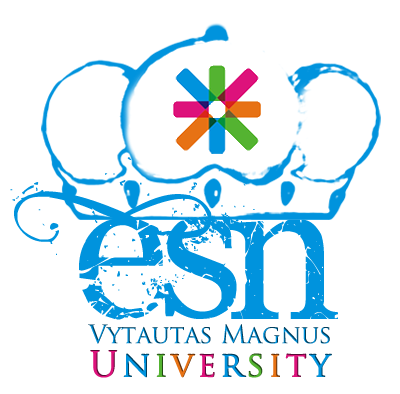 Erasmus postcards event took place on 20th of March at Vytautas Magnus university‘s dormitory “Baltija”. Long before the semester started, international students were asked to bring some postcards from their countries. During the evening we asked our students to sign the postcards and write some words in their native language and also to share impressions and thoughts about Lithuania.These postcards will be sent to Lithuanian schools in order to spread the word about ESN and overall about Erasmus program. Even though signing the postcards was the main activity, international students together with ESN’ers had fun by playing games as well. After the task of introducing ourselves and getting to know each other better, the fun part has started. Finding a clip on your colleague being blindfold, making a confused circle by holding hands and puzzling it out, whispering words to your friend and waiting for the funny change of it till the last person hears and says it loudly and getting sweets after all the tasks created a warm and welcoming atmosphere. The final part of the event was signing postcards. All foreign students took the task seriously and were carefully signing the postcards they have brought. Some students were thinking what to write, others – how to arrange everything what they wanted to say in that small piece of paper. Finally, all the postcards were collected and now they are waiting for the moment to get through the school’s doors. Marta, one of our international students from Poland, who also took part in this event thinks that this initiative will show pupils how big the world is, help them to became more open-minded and tolerant to other cultures and might make them love our Homeland even more when they will realize that foreigners love it as well.